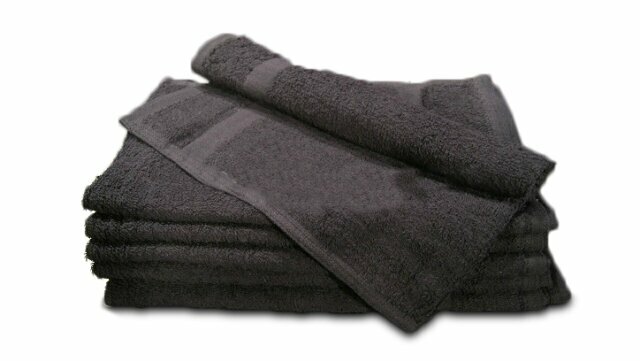 Wholesale hand towels in black color made of 100% cotton these towels are extra soft and highly absorbent. Size of 15x25(2.4Lb) popular with businesses like hair salons, nail salons, gyms, workout,schools, studios, doctor's office etc. Black hand towels add a touch of classic charm to any barbershop or beauty business, so up your sophistication level with premium black hand towels. They’re made of the finest fibers and are soft as well as durable. The fabric is 100 percent cotton and is perfect for clients with sensitive skin. In your line of business, it’s important to have a ready supply of towels on hand and available. Our amazing wholesale prices at Towel Super Center make this a cinch. Don’t buy towel after towel, replacing old and fraying hand towels that can’t cut it. Our well-made products ensure that when you buy our towels in bulk, they’ll last you. Plus, our prices are the best on the web. Black is often associated with sophistication and professionalism — think a little black dress or a black tux. However, in salons, it has a more utilitarian purpose. Black hand towels won’t show every little stain from messy hair products or nail polish. This is a common issue at most salons which is solved easily with these dark-colored towels. If you want your salon to be associated with these sleek yet supple hand towels, then be sure to purchase premium black hand towels today. You can even get your salon’s name, logo or motto embroidered on the towel by having us ship your order directly to your local embroiderer. Black has the added advantage of complementing many different hues. If you would like to match your towels to the color scheme of your décor, purchase our premium black hand towels alongside our large selection of other premium cotton towels. We sell every shade of the rainbow. If you expose your black hand towels to any sort of chemical or bleaching element, like dyes, cosmetics or nail care products, rinse the towel immediately. This could save it from staining or splotching. Never use bleach. Be sure to wash your black towels using a bleach-free alternative. Avoid fabric softener as this could fade the color of the black hand towel over time. It also creates a moisture block, leaving your towels less absorbent. Instead, try using dryer sheets to instill extra softness. Letting your towels sit around wet or damp can cause them to smell musty. Even though cotton naturally resists odors, they should still be laundered regularly. We know that buying a large number of towels is a necessity for any salon, barbershop or beauty business. That’s why we offer incredible discounts the more you buy. You can purchase a unit of a dozen towels and still pay less than retail. Or you can purchase your year’s supply of towels and save even more per towel. Wholesale doesn’t get any better than Towel Super Center. Order your premium black hand towels today by placing your order online.